The third and final role which is essential to start working with Scrum is the Scrum Master. As every other role, Scrum Master also has its own accountability and responsibility. Scrum Master in the simplest terms can be described as the master of Scrum. This is one person role; accountable for ensuring that Scrum is understood and enacted within the team. Scrum Master is also accountable for removing the impediments of the team. The Scrum Master is a servant-leader, coach, mentor, teacher, facilitator and a change-agent. The Scrum Master keeps changing style and approach as needed by the situation with a purpose to help people understand Scrum framework better. Helping teams, stakeholders to understand software product development in an empirical environment. When an organization is starting up with Scrum and the teams are unaware about Scrum; it is Scrum Master’s responsibility to hand-held them and teach them the essentials of Scrum. In this situation the Scrum Master acts as a teacher. The Scrum Master enforces the rules and ensures that the team follows the same as they are told. This stage is often known as the “Shu” stage of the Shu-Ha-Ri concept. The Scrum Master teaches about each role, its accountability; every artifact, event and their purpose. The Scrum Master also teaches the development team how the product emerges during the empirical product development; emphasizing on the fact that software development happens in a complex environment. Teach the development team about how they can utilize tactics to create maximum business impact using Scrum. The role of a coach is to unleash the power of coachee. As a coach the Scrum Master brings in third person perspective to the team. The Scrum Master believes that the team is capable of solving all of their problems; may be they are just not aware of it. As a coach, Scrum Master reminds the team of their potential by probing them, by asking open ended questions. I would like to share an analogy that one of my fellow coach Satish Narayanappa shared with us. The Development Team is like the Monkey God – Lord Hanuman of Indian mythology. Lord Hanuman was bit mischievous as a kid and with his immense power used to create nuisance for people around. As a result, he was cursed that he would forget all his powers unless someone reminds him of the same. Not saying that the Development Team creates a nuisance with all the power it has; however it tends to forget that it has the great power to create an awesome product. It knows how to write clean code, yet it does not write. The Development Team also knows the benefits of pair programming and test driven development(design) but under work pressure doesn’t pay attention to it. As a coach, the Scrum Master keeps reminding the Development Team about all the things that they tend to overlook in their busy schedule; probes the Development Team so that they themselves identify the pitfalls and solutions. More often then not, Scrum Master wears the coaching hat when the Scrum Team is in the “Ha” stage of Shu-Ha-Ri and Scrum Master helps them looking at new perspectives. Coaching is all about bringing in a third person perspective and helping the development team find solutions to their problems. The Scrum Master may coach at individual, team or organization level. 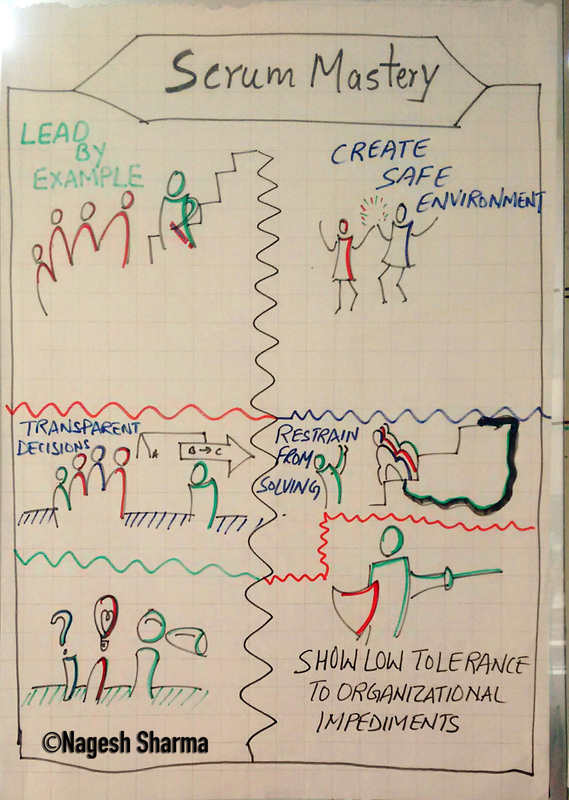 At individual level Scrum Master coaches about the mindset; at team level coaches about conflicts, continuous improvements and purpose of the team; at organization level coaches about Scrum adoption, delivering business value early and often, waste elimination, collaboration across teams etc. A mentor is a subject matter expert who shares knowledge and experiences and helps the mentee to get to next level. The mentor acts as a guide or counsellor to the mentee. The Scrum Master acts as a Mentor when the team moves to the next stage in Shu-Ha-Ri i.e. “Ri”. The team is already aware of their potential. They no longer need to be reminded of the rules but are bending the rules within boundaries to create maximum business impact. This is when a Scrum Master acts as a mentor, an advisor/guide sharing relevant knowledge and experience. A Scrum Master often plays the role of a mentor to other Scrum Masters who are experimenting with the knowledge and experiences that they have. “An individual who enables groups and organizations to work more effectively; to collaborate and achieve synergy. He or she is a ‘content neutral’ party who by not taking sides or expressing or advocating a point of view during the meeting, can advocate for fair, open, and inclusive procedures to accomplish the group’s work”. A Scrum Master has to often wear the hat of the facilitator. And No, its not just during the Scrum Events. As Barry Overeem mentions in his whitepaper that it is the biggest misunderstanding that people have about what a Scrum Master has to facilitate. Facilitate team members to find their intrinsic motivations. A change agent is someone who can help in bringing a change in the organization. A person who can be a catalyst for the transformation of an organization. The Scrum Master battles the organizational impediments and builds the culture to embrace change. The Scrum Master creates an environment, a culture where the Scrum Teams can thrive. The Scrum Master is a manager, but not in traditional context. This is not a hierarchical position. That means the Scrum Master does not have any power over the team members in any aspect like careers, bonuses, promotions, assigning work etc. The Scrum Master embodies a horizontal management and is a manager in an Agile context. Manage the Scrum process so that team can focus on the purpose to generate value. Manage boundaries provided by Scrum for self-organization and cross-functionality. Manage outside interactions with the team so that the team is not distracted. Manage the time-boxes to eliminate risks. Create a safe-environment where the team has no fear to experiment or to fail. Create an environment of trust and progressive dissent without the fear of conflict. Raise the transparency at all levels. The Scrum Master is the servant-leader, accountable for ensuring that Scrum is understood & enacted within the team and removing impediments. Agile, Scrum, Scrum Master, Scrum Roles. Bookmark.